5 min: Castle of Manzanares el Real, the Mendoza Castle, and a medieval fortress, half-military and half-residence. Close and genuine, this is where the Charter of the Community of Madrid was signed. 15 min: Basilica of the Assumption, in Colmenar Viejo. Free entry. 25 min: Patones de Arriba. A small mountain village, so hidden that when Napoleon’s troops invaded Spain, this village was not conquered and has even been called a ‘King of Patones’. 40 min: La Granja de San Ildefonso, a Baroque palace, and gardens with spectacular vegetation. This was the summer residence of the kings. 45 min: Madrid, with all that it represents: museums, shopping, concerts, cuisine… And it is easy to get there from the campgrounds! 45 min: El Escorial Monastery, a palace constructed in 1584, was considered to be the eighth wonder of the world. Felipe II was its main inhabitant. 45 min: Alcala de Henares, the City of Cervantes. 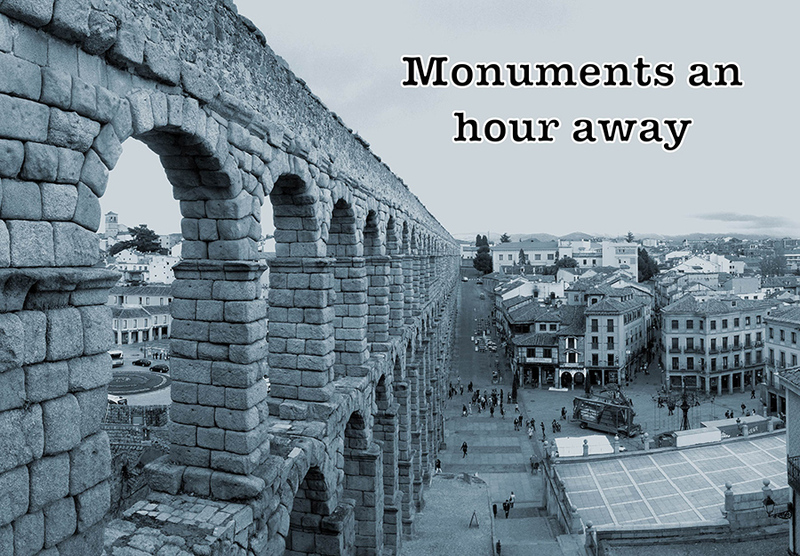 60 min: Segovia, a monumental city par excellence, it stands out for its aqueduct, an important Roman construction from the Second Century B.C.E., which is definitely a must-see. 60 min: Pedraza, a small Castilian village, a unique and ancient centre, this is a town that invented “candle-lit nights” which are illuminated with thousands of small candles. 90 min: Undoubtedly, Avila, a medieval walled city worth visiting for its famous walls. Experiencing it in the summer can be very rewarding, since its altitude and proximity to the Sierra de Gredos Mountains keeps the temperatures from getting too high.